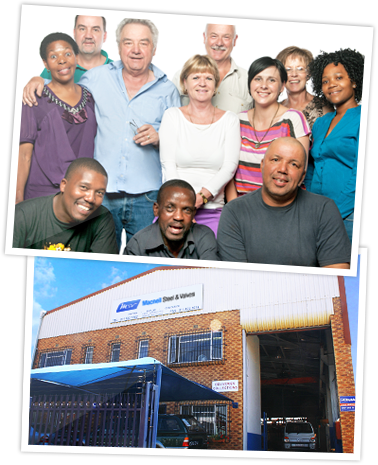 Macneil Steel and Valves was established in 1983 by Tony Macneil, and from very humble beginnings operating from a side street shop in Germiston, it has grown from strength to strength and is now a multi million Rand business operating from a new warehouse/office facility in the Knights Industrial area which is on the Eastern side of Johannesburg South Africa. Brian Saverton joined forces with M.S.V. in 1993 bringing with him his extensive knowledge and expertise of the valve industry, adding a new dimension to the M.S.V. field of business in the area’s of water purification, sewage handling and water treatment projects. M.S.V.’s Mission: Quality people selling quality valves at a quality company. To ensure our mission is fulfilled M.S.V. has a dynamic sales, financial and delivery team who will meet our customers needs. We hope you find our website informative and interesting.